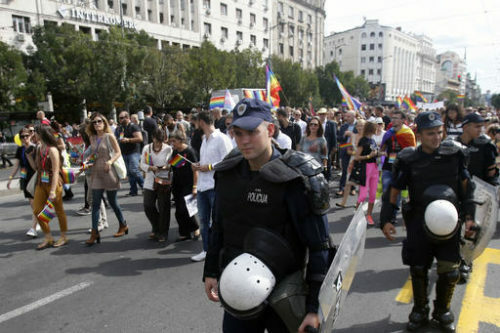 BELGRADE, Serbia (AP) — Thousands of Serbian riot police cordoned off central Belgrade on Sunday for a gay pride march which was held amid fears of attacks from extremists in the predominantly conservative Balkan country. Holding banners and flags, several hundred people marched in the downtown area as helicopters flew above. Police with dogs secured the zone that was sealed off for traffic for hours before the planned start of the event. Authorities have cancelled several pride events in the past after massive clashes with right-wing groups and soccer hooligans in 2010 when more than 100 police and extremists were injured and the city center was demolished. Serbia has since sought to boost gay rights as part of its bid to join the European Union, including appointing for the first time an openly gay minister in the government that was formed last month. Ana Brnabic, the minister of public administration and local government, attended Sunday’s march. She said the government will work to improve the position for Serbia’s gays as well as other minority groups, who still often face harassment and discrimination. “The message this government is sending is important,” Brnabic said. Fueling fears of unrest ahead of the pride march were clashes in Belgrade late on Saturday between rival soccer fan groups — who are linked with right-wing extremists — and who also clashed with the police. Authorities said that eight policemen were injured and fifty hooligans arrested in Saturday’s clashes.